-Please note: Some heavier or less active breeds, such as bulldogs, may have difficulty with excessive exercise. The WalkyDog Plus is the top selling dog bike leash in the country and has been the most trusted brand for safely biking your dog over the past 12 years. The new Plus version of the WalkyDog has been completely upgraded with stronger metals, a stronger leash clip, stronger cord, and an updated quick-lock/release mechanism. 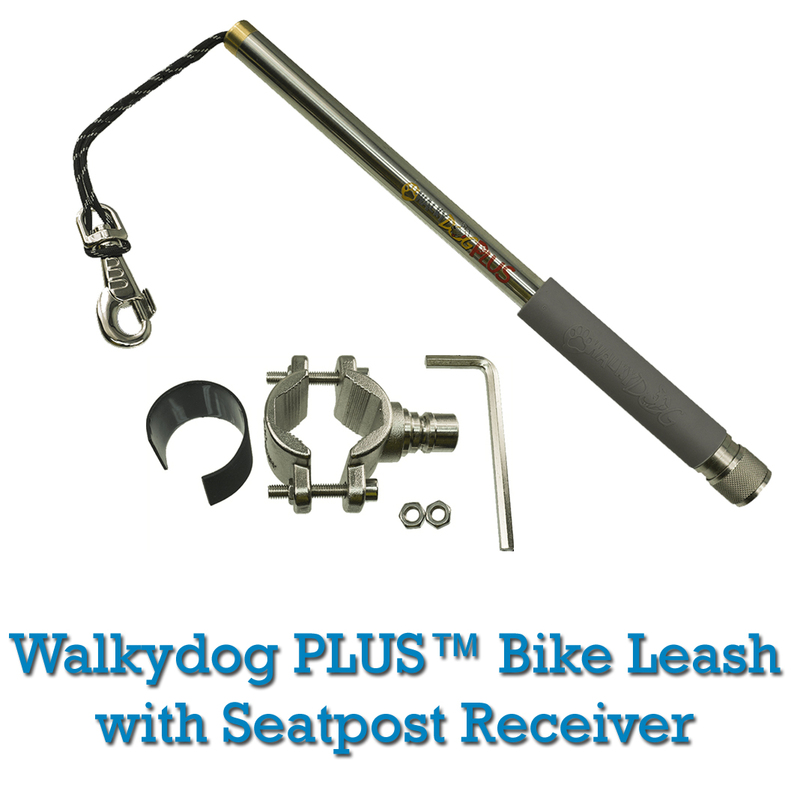 The internal springs of the WalkyDog Plus absorb the pulls of your dog while keeping them in the safe zone right next to your bike and out of harms way. 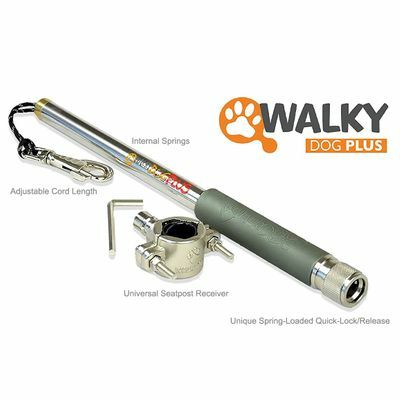 The WalkyDog Plus is easy to use, easy to install, and adjustable for medium (at least 25 lbs) to large dogs. The patented quick-lock/release feature makes it a breeze to quickly get on and off your bike. No other bike leash on the market offers this feature. Military Grade 550 paracord for added strength and longevity with adjustable internal spring system for dogs of varying strengths. Exercise is key to having a happy, healthy, well balanced dog. The sad truth is that most dog owners don't have the time or energy to satisfy their dog's exercise needs and as a result, many dogs are overweight. This leads to medical issues down the road which could easily be avoided. Having the option to bike your dog in addition to normal exercise activities like walking, jogging, playing fetch, or taking your dog to the park, mixes things up and keeps the exercise routine fun and exciting. Biking is truly a fun activity for both you and your dog and many customer tell us their dog bolts for the door in excitement when they mention the word bike ride. Many dog owners can't keep up with their dogs when running or jogging them. Their dog may want to run faster or for longer distances than the owner can handle. Being able to safely bike your dog with the WalkyDog Plus allows you to exercise your dog on their level and in a fraction of the time. While next to the bike, many people report that their dog goes into an instinctive traveling mode and become more focused than on a normal walk because they can move at their desired pace. Why Use A Dog Bike Leash? 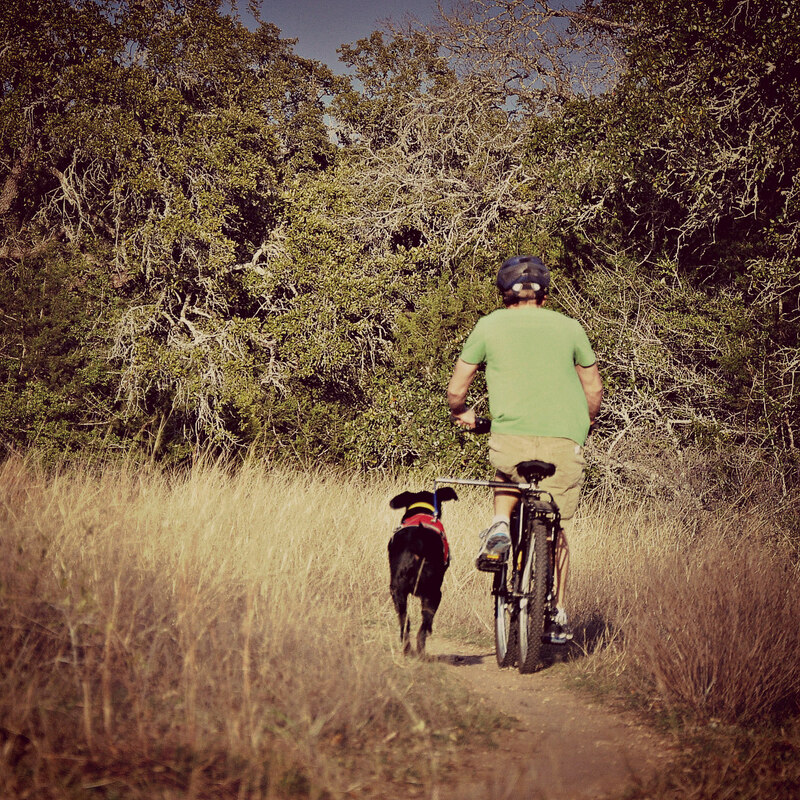 While biking can be a fun activity for you and your dog, doing so without the right equipment can be extremely dangerous. 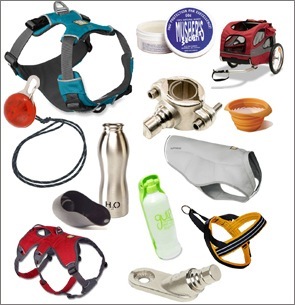 Many customers find our products after attempting to bike their dog holding a normal leash. 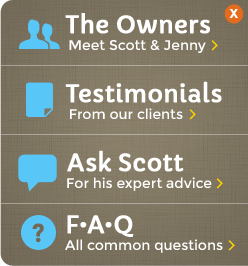 You might imagine the scary situations that can occur. 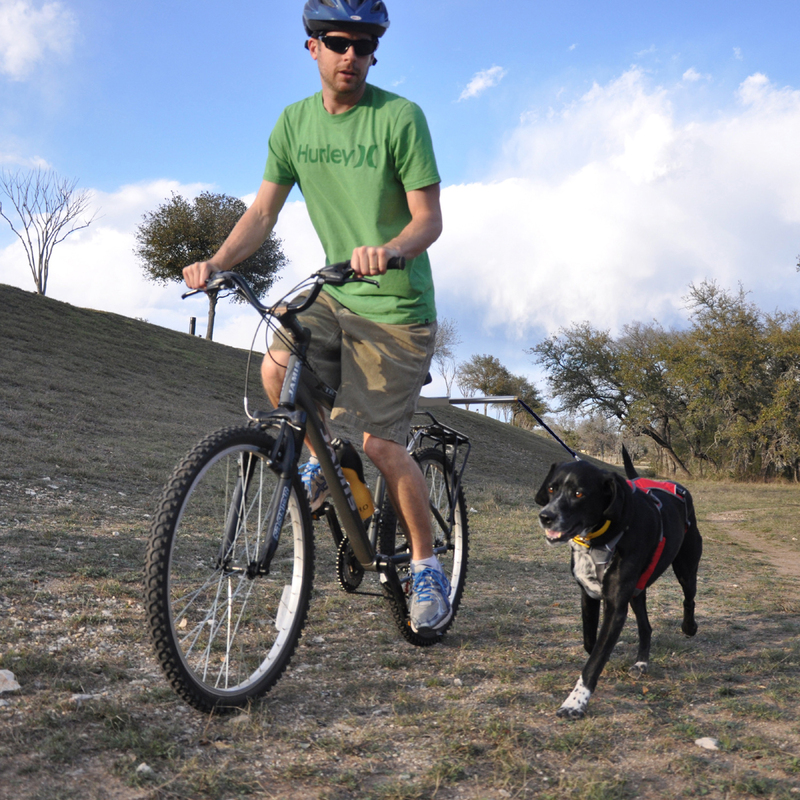 For one thing, holding a leash while riding gives your dog far too much control over the bike. They can easily pull you off balance leading to a crash. Using a regular lead will also allow your dog to get too close to the front tire and possibly run in front of it. A normal leash doesn't offer any sort of pull absorption either. 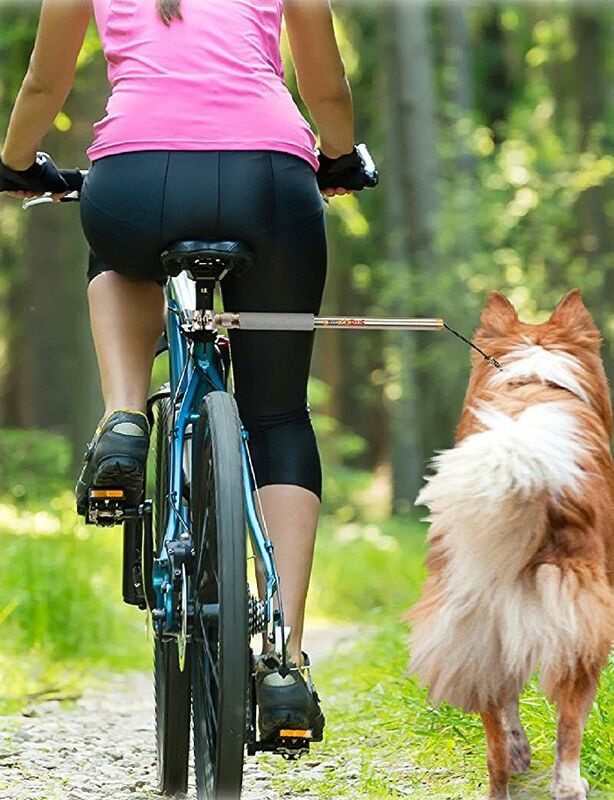 Using a dog bike leash like the WalkyDog Plus allows you to connect your dog to the bike while keeping both hands on the handle bars and in control. The internal springs absorb pulls from your dog and the rigid WalkyDog bar keeps your dog positioned in the safety area right next to the bike (not too far forward or too far back). This also allows you to keep an eye on your dog at all times. 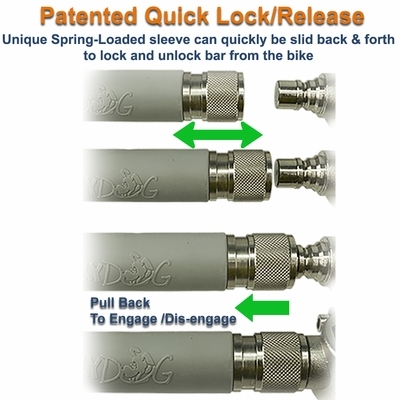 The WalkyDog Plus is quick to attach and easy to detach with the universal seatpost clamp and quick-lock release mechanism. You can have it on or off your bike in less than a second. It also can transition to a pull absorbing walking lead if desired when taken off the bike. Below are some of the accessories I use with the WalkyDog. They are not required, but are items I have found helpful over the years and decided to carry. A spare seatpost clamp for a second bike. This makes switching the WalkyDog between bikes effortless. Something to bring water along for the ride. It is very important to keep your pet hydrated. Paw pad protection. It is important to monitor the wear on your dogs paw pads. They will toughen up over time, but products such as Musher�s Secret can help condition, protect, and toughen your dogs pads in all types of environments. Spare cord - Useful to have in case you ever need to replace the standard cord that comes with the WalkyDog after extended use with a powerful pulling dog. The standard cord won't wear down overnight, but with a powerful puller it may begin to wear down over time - you would notice this happening and be able to change it long before the cord became compromised. Also useful if you want to make your own custom length line. The cord I carry is military strength and tested for 550 lbs. Cooling vests for summertime heat. I strap a large thermos with cool water to my bike and take Parker�s cooling vest along for the ride with us. When we take breaks I put on his cooling vest to cool him down. A dog bike trailer. A great way to go on extended rides so your dog can rest when tired.